Garlic Herb Shrimp for a quick easy dinner, elegant appetizer, topping for salad or a light summer lunch. 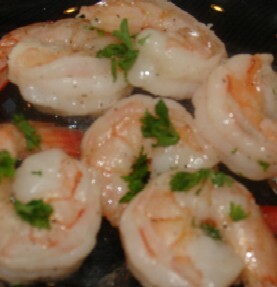 Serve shrimp hot or cold, use fresh herbs from garden, and your kids will love. Shrimp, defrosted, no shells, uncooked - 1 1/2 lbs. 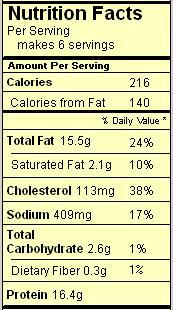 Preheat a non-stick or other heavy skillet over medium-high heat with 1 Tablespoon olive oil and 1 Tbsp. butter until hot, but not smoking. 1. Into hot skillet carefully pour olive oil, garlic, salt, pepper and shrimp. Cook, stirring contents often, until shrimp are pink and opaque about 5-10 minutes, being careful not to over-cook. Remove shrimp from pan and set aside. 2. Off the heat pour white wine into pan and cook over high heat until reduced, about 10 minutes. Stir shrimp back into hot pan, and sprinkle with parsley. 3. If serving hot, serve immediately over rice or pasta. Be sure to include a nice loaf of bread to absorb the pan juices. 4. If serving cold, remove pan from heat. Take shrimp out of wine sauce and chill. © Copyright 2008 DinnerMeQuickly.com Recipes may not be sold or published without written approval.